More changes are coming to the Hunt Valley Towne Center in Northern Baltimore County. Hunt Valley used to be an indoor mall, but that was converted to an outdoor mall about 20 years ago. Now, it seems changes are afoot again for the shopping center. Michael's and Home Goods have already moved in on the first floor of the former Sears building at the facility, utilizing part of the original mall. Now the property owners are converting the second floor of the old department store and bring in more stores. It’s all just the beginning of what's in store for the Hunt Valley Towne Center. Greenberg Gibbons and Seritage Growth properties are working together to redevelop nearly 14-acres of land here. Besides more retail stores and entertainment options, the first phase of a new $150 million expansion project also will include luxury apartments, office space, and even a hotel. Other shopping centers Greenberg Gibbons has developed in the Baltimore area include the Annapolis Towne Center, the Towne Centre in Laurel, and Foundry Row in Owings Mills. Seritage Growth Properties formed in 2015 as it acquired a collection of real estate properties from the now bankrupt company Sears Holdings. The companies haven't yet released the names of what other stores and what brand hotel we can expect to see here, or a target date for when the project will be done. HUNT VALLEY, Md. 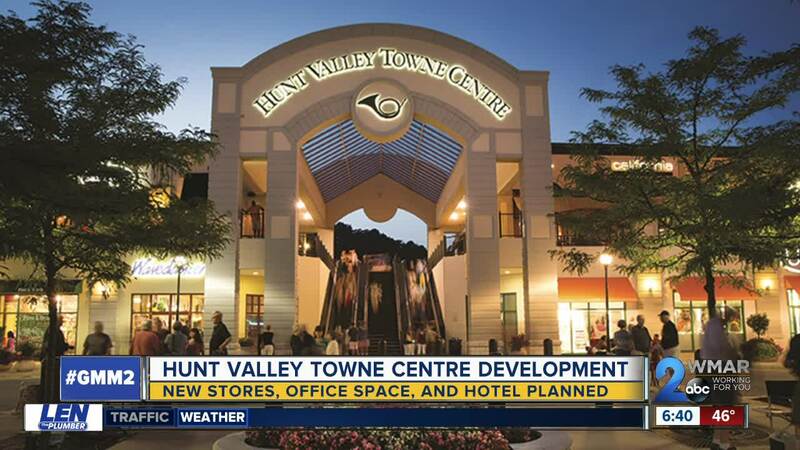 — More changes are coming to the Hunt Valley Towne Center in Northern Baltimore County. Hunt Valley used to be an indoor mall, but that was converted to an outdoor mall about 20 years ago. Now, it seems changes are afoot again for the shopping center. Michael's and Home Goods have already moved in on the first floor of the former Sears building at the facility, utilizing part of the original mall. Now the property owners are converting the second floor of the old department store and bring in more stores. It’s all just the beginning of what's in store for the Hunt Valley Towne Center. Greenberg Gibbons and Seritage Growth properties are working together to redevelop nearly 14-acres of land here. Besides more retail stores and entertainment options, the first phase of a new $150 million expansion project also will include luxury apartments, office space, and even a hotel. Other shopping centers Greenberg Gibbons has developed in the Baltimore area include the Annapolis Towne Center, the Towne Centre in Laurel, and Foundry Row in Owings Mills. Seritage Growth Properties formed in 2015 as it acquired a collection of real estate properties from the now bankrupt company Sears Holdings. The companies haven't yet released the names of what other stores and what brand hotel we can expect to see here, or a target date for when the project will be done.